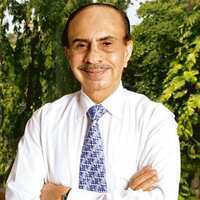 Going strong: Godrej Industries chairman Adi Godrej. Mumbai: Diversified conglomerate Godrej Industries Ltd on Monday posted a 6,854% growth in profit after tax for the second quarter ended 30 September to Rs19crore from Rs0.3 crore for the same period last year. Total income grew 31% to Rs965 crore, up from Rs734 crore. The company’s shares closed 18.18% higher at Rs72.15, on a day that the Bombay Stock Exchange’s benchmark Sensex index lost 2.2%. “Godrej Industries’ performance and growth during the first half of this year has maintained its trajectory and pace despite an uncertain economic environment," chairman Adi Godrej said in a statement. Godrej Industries’ chemicals unit and Godrej Agrovet Ltd together accounted for 65% of total revenues. The chemicals division increased its revenues by 39% to Rs232 crore. Export revenues increased 50% and accounted for 43.6% of the division’s revenues, the company said. Godrej Agrovet, which deals in animal feeds, agricultural inputs, poultry, palm oil and rural retailing, had revenue growth of 10% to Rs395 crore for the second quarter, up from Rs361 crore for the same period last year. During the period, Godrej Agrovet inked a venture with Tyson Foods Inc., the world’s largest meat processor, which also processes and markets poultry products. Tyson Foods owns 51% in Godrej Tyson Foods Ltd.